See in Glossary where your game can work perfectly in the Unity editor but then doesn’t work or maybe doesn’t even start on the actual device. The problems are often related to code or content quality. This section describes the most common scenarios. The game stops responding after a while. Xcode shows “interrupted” in the status bar. Scripting errors such as using uninitialized variables, etc. Using 3rd party Thumb compiled native libraries. Such libraries trigger a known problem in the iOS SDK linker and might cause random crashes. Using generic types with value types as parameters (e.g. List<int>, List<SomeStruct>, List<SomeEnum>) for serializable script properties. Using reflection when managed code stripping is enabled. Errors in the native plugin interface (the managed code method signature does not match the native code function signature). Information from the XCode Debugger console can often help detect these problems (Xcode menu: View > Debug Area > Activate Console). The Xcode console shows "Program received signal: “SIGBUS” or EXC_BAD_ACCESS error. See in Glossary bundle without first checking that it was downloaded correctly. Get stack traces again as described above. EXC_BAD_ACCESS starts occurring when an external library is linked to the Unity iOS application. Add -mno-thumb flag there and rebuild the library. If the library source is not available you should ask the supplier for a non-thumb version of the library. See in Glossary, etc. 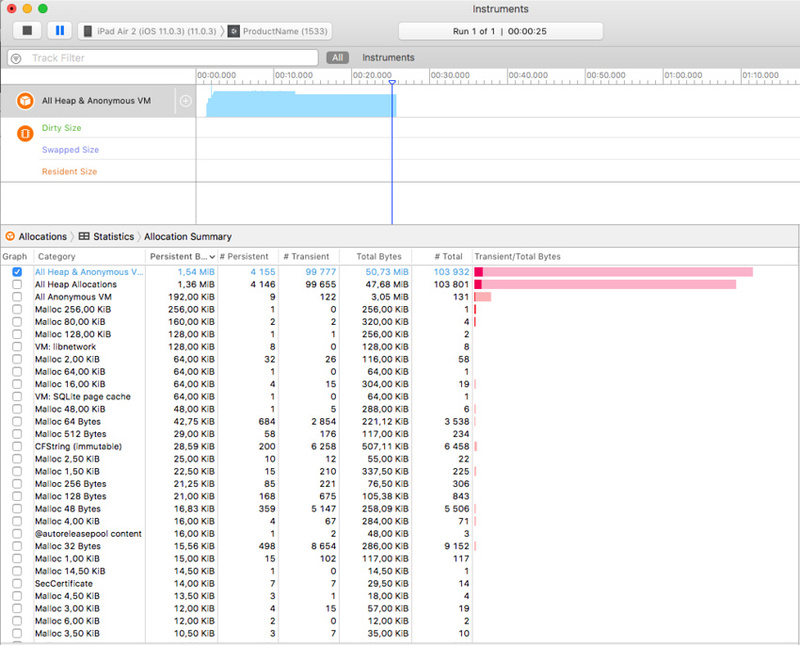 Your application memory usage can be tracked by two Xcode Instruments tools: Activity Monitor and Allocations. You can start from the Xcode Run menu: Product > Profile and then select specific tool or via Xcode > Open Developer Tools > Instruments. Activity Monitor tool shows all process statistics including Real memory which can be regarded as the total amount of RAM used by your application. Note: OS and device HW version combination might noticeably affect memory usage numbers, so you should be careful when comparing numbers obtained on different devices. See in Glossary. Total memory usage can be determined via Xcode Instruments as shown above. This figure includes parts of the application binary, some standard framework buffers, Unity engine internal state buffers, the .NET runtime heap (number printed by internal profiler), GLES driver heap and some other miscellaneous stuff. The other tool displays all allocations made by your application and includes both native heap and managed heap statistics. The important statistic is the Net bytes value. Reduce the application binary size by using the strongest iOS stripping options, and avoid unnecessary dependencies on different .NET libraries. See the Player settings and Optimizing the size of the built iOS Player for further details. See in Glossary for textures and use low poly models. See the manual page about reducing file size for more information. Don’t allocate more memory than necessary in your scripts. Track mono heap size and usage with the internal profiler. Querying the OS about the amount of free memory may seem like a good idea to evaluate how well your application is performing. However, the free memory statistic is likely to be unreliable since the OS uses a lot of dynamic buffers and caches. The only reliable approach is to keep track of memory consumption for your application and use that as the main metric. Pay attention to how the graphs from the tools described above change over time, especially after loading new levels. The game runs correctly when launched from Xcode but crashes while loading the first level when launched manually on the device. There could be several reasons for this. You need to inspect the device logs to get more details. Connect the device to your Mac, launch Xcode and select Window > Devices and Simulators from the menu. Select your device in the window’s left toolbar, then click on the Show the device console button and review the latest messages carefully. Additionally, you may need to investigate crash reports. You can find out how to obtain crash reports here: http://developer.apple.com/iphone/library/technotes/tn2008/tn2151.html. The Xcode Organizer console contains the message “killed by SpringBoard”. Currently Type.GetProperty() and Type.GetValue() are supported only for the .NET 2.0 Subset profile. You can select the .NET API compatibility level in the Player settings. Note: Type.GetProperty() and Type.GetValue() might be incompatible with managed code stripping and might need to be excluded (you can supply a custom non-strippable type list during the stripping process to accomplish this). For further details, see the iOS player size optimization guide. See in Glossary. The AOT compiler can be hinted to include code by adding a dummy method somewhere in the script code. This can refer to the missing methods and so get them compiled ahead of time. Note: Value types are basic types, enums and structs. .NET Cryptography services rely heavily on reflection and so are not compatible with managed code stripping since this involves static code analysis. Sometimes the easiest solution to the crashes is to exclude the whole System.Security.Crypography namespace from the stripping process. The stripping process can be customized by adding a custom link.xml file to the Assets folder of your Unity project. This specifies which types and namespaces should be excluded from stripping. Further details can be found in the iOS player size optimization guide. This error usually happens if you use lots of recursive generics. You can hint to the AOT compiler to allocate more trampolines of type 0, type 1 or type 2. Additional AOT compiler command line options can be specified in the Other Settings section of the Player settings. For for type 0 trampolines specify ntrampolines=ABCD, where ABCD is the number of new trampolines required (i.e. 4096). For type 1 trampolines specify nrgctx-trampolines=ABCD and for type 2 trampolines specify nimt-trampolines=ABCD. The most common mistake is to assume that WWW downloads are always happening on a separate thread. On some platforms this might be true, but you should not take it for granted. Best way to track WWW status is either to use the yield statement or check status in Update method. You should not use busy while loops for that. See in Glossary will result in iOS redrawing the window immediately (the most common example is adding a UIView with a UIViewController to the main UIWindow). If you call a native function from a script, it will happen inside Unity’s PlayerLoop, resulting in PlayerLoop being called recursively. In such cases, you should consider using the performSelectorOnMainThread method with waitUntilDone set to false. It will inform iOS to schedule the operation to run between Unity’s PlayerLoop calls. Check that you have built a Development build, and checked the Script Debugging and Autoconnect Profiler boxes (as appropriate). See in Glossary will make a connection to the remote device on a port in the range 55000 - 55511 to fetch profiler data from the device. These ports will need to be open for UDP access. If your application runs ok in editor but you get errors in your iOS project this may be caused by missing DLLs (e.g. I18N.dll, I19N.West.dll). In this case, try copying those dlls from within the Unity.app to your project’s Assets\Plugins folder. The location of the DLLs within the unity app is: Unity.app\Contents\Frameworks\Mono\lib\mono\unity You should then also check the stripping level of your project to ensure the classes in the DLLs aren’t being removed when the build is optimised. Refer to the iOS Optimisation Page for more information on iOS Stripping Levels. Typically, such a message is received when the managed function delegate is passed to the native function, but the required wrapper code wasn’t generated when the application was built. You can help AOT compiler by hinting which methods will be passed as delegates to the native code. This can be done by adding the MonoPInvokeCallbackAttribute custom attribute. Currently, only static methods can be passed as delegates to the native code. This error usually means there is just too much code in single module. Typically, it is caused by having lots of script code or having big external .NET assemblies included into build. And enabling script debugging might make things worse, because it adds quite few additional instructions to each function, so it is easier to hit that limit. Enabling managed code stripping in Player settings might help with this problem, especially if big external .NET assemblies are involved. But if the issue persists then the best solution is to split user script code into multiple assemblies. The easiest way to this is move some code to Plugins folder. Code at this location is put to a different assembly. Also, check the information about how special folder names affect script compilation.